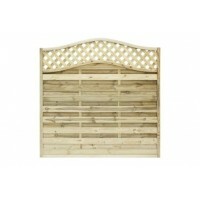 TJ's has compiled the Elite St Meloir fence panels pack for your convenience. The fence panels are made using a dome top frame with horizontal slats which are secured in a rebate frame to create a stylish but practical fence, the panel is finished with an elegant diamond trellis. This fence panel provides the privacy required but does not block out the light in the garden. These panels are made from FSC timbers and are manufactured to a high standard, planed and pressure treated with a pale green finish. Covering an area of 19ft the pressure treated St Meloir fencing pack @ 6ft high consists .. Covering an area of 25ft 3” the pressure treated St Meloir fencing pack @ 6ft high consists of .. Covering an area of 31ft 6" the pressure treated St Meloir fencing pack @ 6ft high consists of .. Covering an area of 37ft 9" the pressure treated St Meloir fencing pack @ 6ft high consists of .. Covering an area of 44ft the pressure treated St Meloir fencing pack @ 6ft high consists of .. Covering an area of 50ft 3" the pressure treated St Meloir fencing pack @ 6ft high consists of .. Covering an area of 56ft 6" the pressure treated St Meloir fencing pack @ 6ft high consists of .. Covering an area of 62ft 9" the pressure treated St Meloir fencing pack @ 6ft high consists of ..